March 5 marked the fifth anniversary of the death of Hugo Chavez, which was the underlying occasion for the International Solidarity meeting “Todos Somos Venezuela” (We are all Venezuelans) in Caracas, March 5-7, 2018. A rush of emotions was felt collectively while close to 350 delegates from 95 countries paid homage to Commander Hugo Chavez at his resting place at the Cuartel de la Montaña in Caracas. Chavez left an undeniable imprint in the history of Venezuela, Latin America and many other countries struggling for social justice. His legacy can be distilled to his unwavering commitment and drive to uplift the social status of all Venezuelans and restore their dignity after decades of neglect from the two main alternating parties in government. Author and former Cuban Ambassador to Venezuela from 1994 to 2009, German Sanchez Otero captured the transcendence of that commitment in the title of his book Hugo Chavez y la Resurrección de un Pueblo (Hugo Chavez and the resurrection of a people. Editorial de Ciencias Sociales, La Habana 2014). Hugo Chavez was a great orator with a direct appeal to the masses with his colloquial style and popular language that inspired trust. That is a rare trait in a political figure. But then Chavez was not your typical politician. He shunned empty rhetoric and that was his most convincing appeal as a leader. He had the ability of speaking to a large audience or on TV and make all feel he was addressing them individually. His speeches were a blend of politics, exposition of ideological programs, and organizational directives on how to stir the new society – his view of what was a retaking of Simon Bolivar’s vision of independence – towards what he called “Socialism of the 21st Century”. A keen sense and awareness of the role of history and people’s protagonist role led him to say what I believe to be one of his simplest and yet most profound statements that defines his ideology, indeed defined his actions until his death: “The people are the fuel of the engine of history”. A suitable byline of that statement might suggest that the “fuel” needed to be refined to a high grade first in order to spark the engine. So he did by empowering the majority of disenfranchised Venezuelans who puntofijismo had taken for granted and abandoned. Chavez enriched Venezuela’s history with a new volume written by the people and facilitated by what we call now Chavismo. In Latin America the people, or what Marxism calls the working class, are typically the forgotten class. They are merely the fuel used by corporations not recorded in the annals of history. However Chavez was not a Marxist. His ideology was a contextual blend of eclectic theories with a strong historical basis. He did not fit the political trend of his time rooted in neoliberalism. How could he? Chavez came to power in the 1990s when there seemed to be a shift of the world leftist ideology towards the centre and right of the political spectrum. That made him appear relatively more radical. 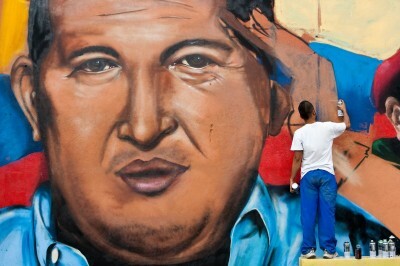 Chavez, like Bolivar at his time, came when he was needed to break patterns and set new trends. He set to break the most obvious pattern: the cycle of poverty in Venezuela with more than 80% of the population living in poverty. He has largely achieved that goal that is now being pursued by president Nicolas Maduro. However, the Venezuelan rightwing opposition, in its drive to discredit Chavismo, repeats the mantra of “humanitarian crisis” together with other “crisis” that are artificially created by ill conceived policies. We must not confuse structural poverty created by a system driven by and for corporations before Chavismo, with scarcity imposed by external factors on Venezuela like sanctions and financial punitive actions now. We must not confuse structural insecurity that did not guarantee jobs and living wages before Chavismo, with fear imposed by threats of foreign invasions and military interventions on Venezuela now. We must not confuse structural misinformation by corporate media before Chavismo, with the artillery of lies and disinformation imposed by a foreign ideology on Venezuela to mislead and confuse now. Before Chavez the social problems were endemic as a result of an obsolete capitalist model stalling without “fuel”. Now the people of Venezuela are participants and protagonists, and reactionary forces are at work to break the engine of history. Chavez’s constitution of 1999 that replaced the “moribund” constitution of puntofijismo is all about people and their relevance in society by granting them not only a participatory role in the revolutionary process but also more fundamentally a protagonist role. That is the greatest of Chavez’s legacies marking the Bolivarian Revolution. It is precisely calling on that legacy that the National Constituent Assembly is again consulting Venezuelans – the original power – legally and in the most democratic process, for ways to strengthen the Bolivarian Revolution. During the three-day solidarity meeting we all had the opportunity to hear President Nicolas Maduro speak, but the powerful presence of Hugo Chavez was felt in the innumerable times he was acknowledged, and in the chanting of Chavez vive (Chavez lives) by delegates including the President.